We were excited to work with Utah Bride and Groom Magazine as a sponsor of the 2014 White Party. It's an event that anyone in the wedding industry in Utah shouldn't miss! This isn't our first time at designing an invitation for a white party, but we wanted to make sure this was extra special for the event. We ultimately decided that metallic silver foil on paper with swirls reminiscent of moire fabric was just the right fit. 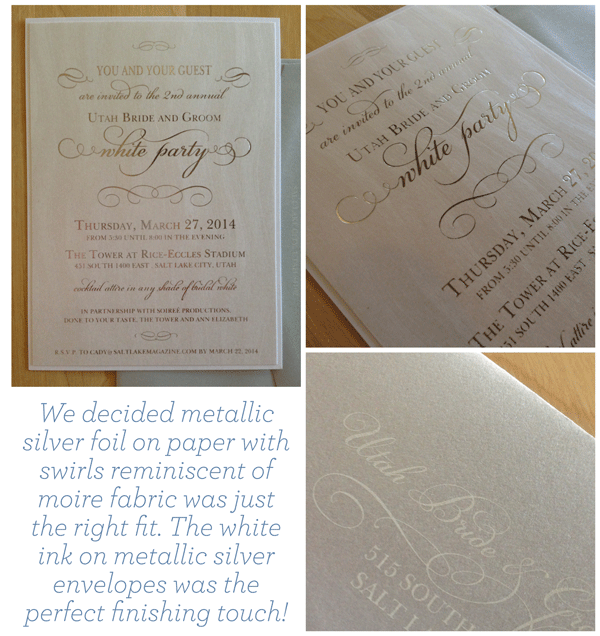 The white ink on metallic silver envelopes was the perfect finishing touch of the set. 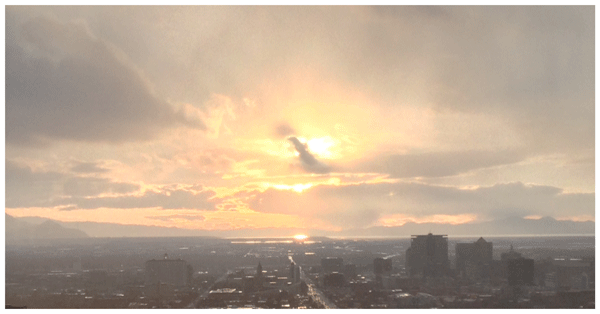 The picture below says a thousand words about the gorgeous sunsets we experience in Utah and The Tower at Rice-Eccles Stadium was the perfect choice to show off Utah's gorgeous skyline and sunset. Not to mention that the weather here is warming up for spring and the grass is greening up, the bulbs that have laid dormant all winter are all showing their green heads, it's a great time of year to be in Utah. The decor by Soiree Productions was beautiful. Take a look at those chairs... gorgeous! Kudos to Soiree Productions for pulling together a gorgeous white inspired color palette. And finally those lovely ladies are some of the Ann Elizabeth crew who attended the party and enjoyed bubbly and the company of all who attended. Thank you Ruth and Bekka for representing Ann Elizabeth!